Shouldn't the Moon appear as bright as a full Moon seen at midnight from Earth? The photo was taken by DSCOVR at Lagrange point 1. In the picture, The Moon appears dark gray. Of course the Earth appears bright, reflecting sunlight from clouds and water. The Moon's surface is gray and should reflect less light than the Earth. It should be irrelevant that we see the far side, since the reflectivity of the Moon's surface should be the same on the far side as the side that faces the Earth. The midnight full Moon appears much, much brighter as seen from Earth than it does in this picture, despite the fact that the amount of sunlight reflecting from the surface of the Moon is the same in both instances. I understand the photo was taken with 3 separate exposures of red, blue and green, but this should not affect the brightness. So why does it appear so dull? That's what it really would look like if you were there with DSCOVR. The albedo of the Moon is only about 0.136, about half of the Earth's average albedo. Of course the part with clouds is higher. I was shocked too, but it was explained in written copy that accompanied the release of the original image. It does. If the moon were a diffuse, white ball, a full moon would be about seven times brighter! If you watch the image or GIF, the Moon is roughly the same brightness as central Australia or the Sahara region. Phil Plait explains well in Bad Astronomy. EDIT: I just ran across these images of astronauts on the surface while reading this answer. 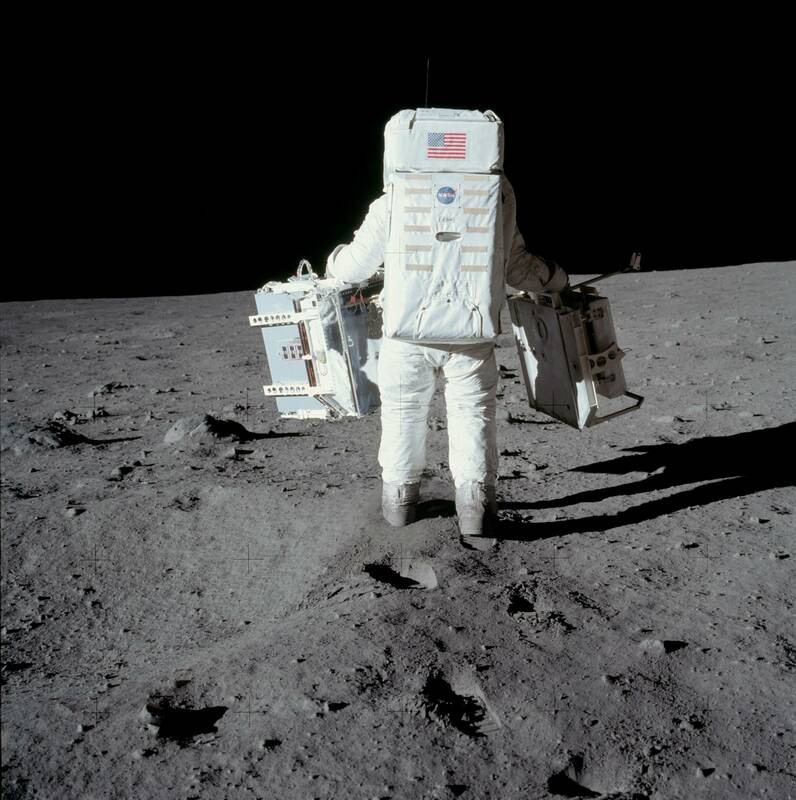 Their suits are not 100% white to begin with, but the Lunar soil - at least in these locations - is significantly darker. It is close to the same color as the (presumably) nearly-black radiator fins for the heat sink of the RTG unit (2nd photo) at the astronaut's foot. 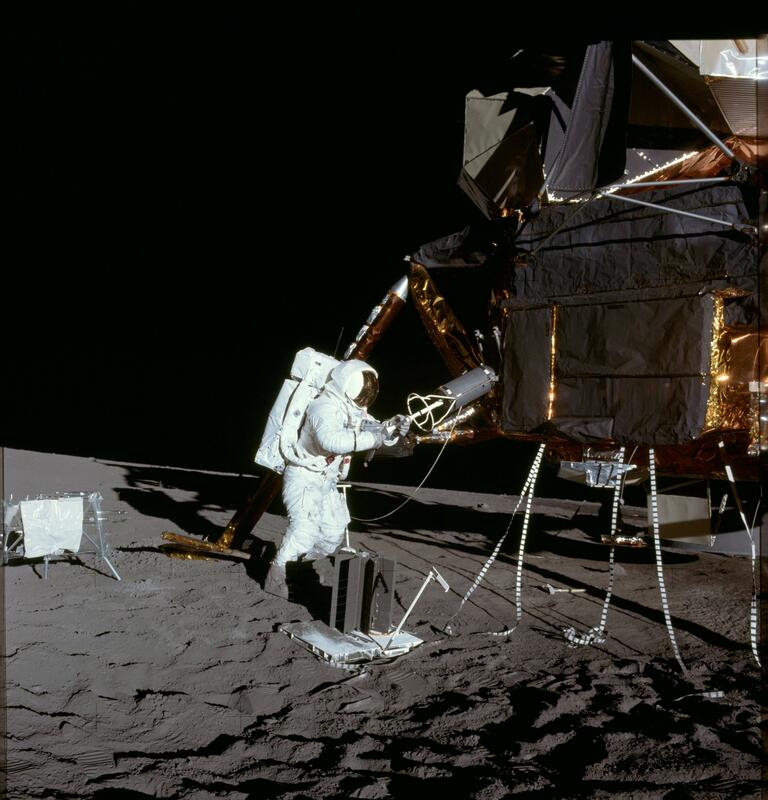 above: "Astronaut Alan L. Bean from Apollo 12, put the Plutonium 238Pu Fuel from the Lunar Module into the SNAP 27 RTG" from here. I think the confusion comes down to what "brightness" means. In general we don't really measure (either with our eyes or our cameras) the absoloute brightness of objects. Instead we measure the brightness relative to other objects in the scene. 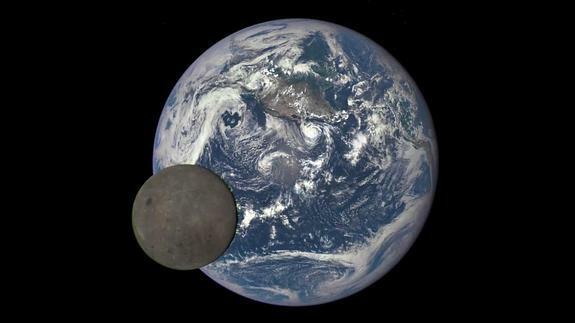 In the photo of the earth and the moon taken from between the earth and the sun the moon looks dark grey because the sunlit earth is brighter than the sunlit moon. In the night sky the moon looks white because it's bright compared to the night sky and the nighttime earth (even with some artificial lighting the nighttime earth is not lit up to anything like daytimes levels.. The other answers have pretty well covered the fact that the moon is made of dark gray stone. But I wanted to mention a way that you can verify this on your own with nothing more sophisticated than a camera with a manual exposure mode. Photographers have a rule of thumb called "sunny 16". This was much more important back in the day when cameras didn't have sophisticated light meters and on-board computers. Basically, the rule says that in direct sunlight, if you set your aperture to f/16, the correct shutter speed will be the reciprocal of your film speed. The moon is a sunlit object, and the sunny 16 rule exposes sunlit objects so they look the way we normally perceive them in sunlight. But if you apply the sunny 16 rule to the moon, it looks dark gray -- its "true" color and brightness as we would perceive it against a sunlit background of average terrestrial brightness. Because if the photograph were taken with an exposure setting that made the moon appear shiny and bright white, the Earth is so much more bright that it would completely wash out the scene. There is no way to objectively measure "brightness" of objects in a photograph without knowing how the image was captured. Not the answer you're looking for? Browse other questions tagged the-moon earth light satellite or ask your own question.